1. Name 3 of your favorite activities or lessons that we did in this class. The paper circuitry, the periodic table and how the atom is like. I like the the paper circuits, I like the paper circuits., I like the paper circuits. Playing on kahoot it, learning about molecules, and metallic bonding. 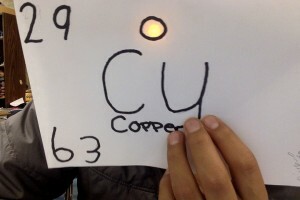 My 3 favorite activities we did in this class was when were doing the paper circuitry. The first time doing my paper circuitry, i was surprised when the lights lit up. My second activities is when doing nearpods. Because we can tell what we learn from lessons that we did in the class. And my last favorite activity was Kahoot it. Because it is more fun than nearpod, we can reach to see got the question right and who’s at the leader board. My favorite lessons was learning which group was more reactive. Another is what element is radeoactive. and one activity is were we did a lab with baking soda water and chloride. 2. What else would you like to learn? I would like to learn more about the elements, because it is cool when I seen how the elements exploded and learn more, which exploded and which ones doesn’t. I would like to learn more about the periodic table. Because i would like to try name all the ones that i know and learn more of all the other names of the periodic table. And because i have never studied about the periodic table before. i would like to learn how to make light from potato. I would like to learn more about how to make bigger circuits with different types of lights. More about the Periodic table. about more electrons that stick to each others. I would like to learn what elements is deadly to humans. I would like to learn about the atmosphere, if that is a Physical Science topic. 3. What was the most difficult part of this class? The most difficult is were we what to do the circut prodjucts. I would say the most difficult parts of this class was doing the ITSI labs. But some of the ITSI labs were kind of fun and easy. When it comes to doing experiments i would think i wouldn’t finish them, but i would. And i think doing the labs are important part of our grades because this is physical science were we do labs, but not just labs. So i try to finish the labs so i can get a good grade on it. The most difficult part was trying to keep up with notes and quizzes. Also, the ITSI labs because the process is too long and we have to do so much in such little time. The most difficult part of this class is remembering the periodic table. And which element goes to where. Doing the quiz on the molecules. The most difficult part of this class was catching up on quizzes and notes. Not necessarily hard doing them but I fell behind a lot and had to do a lot. 4. Name the 3 topics that were your favorite to learn about in this class. covalent bonding, introduction to molecules, metallic bonding. Paper Circuitry, Periodic Table, and The World of Science. I liked it when I learned how to used paper circuitry because I liked it when lights light up and how it is made. I also liked it when I learned the periodic table because I liked it how some of the elements reacted to water and how they exploded. I like when I learned about an atom and how it looks. I liked the Scientific Research and Technology, Introduction to Matter, and the Periodic Table Lessons. One of my 3 topics that were my favorite to learn were learning about molecules, that they are the smallest particles of the covalent compounds. And my second topic tat were my favorite to learn was identifying all the properties of the periodic table. Like if they conduct electricity, or if they are weak or strong, how many valence electrons they have, what their symbols is. And my last favorite topic that was my favorite was learning about another scientists in the past who first discovered atoms.